On a recent visit to the Sacred Valley with my parents, I decided to embark on a mountain biking adventure for the first time from the town of Chinchero to Maras. 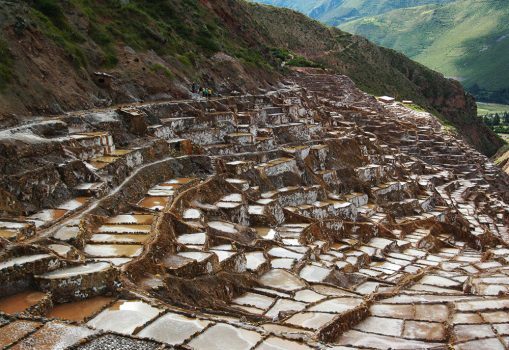 During the adventure, we’d be stopping to visit the archaeological site of Moray, where we’d have lunch and then finish our ride at the salt pans of Maras. 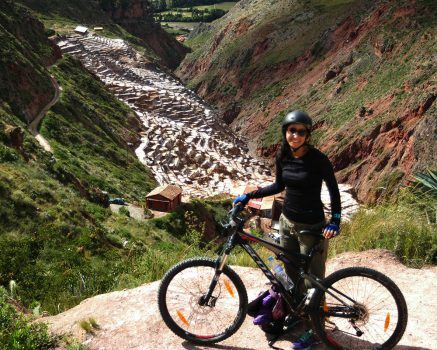 This mountain biking Maras & Moray trip is a great way to combine some of the key sites of the Sacred Valley while pedalling through green countryside away from the crowds. 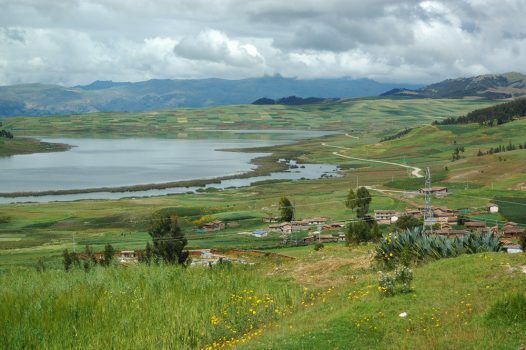 Alternatively, it’s also possible to do a similar trip on foot by trekking between Maras and Moray. 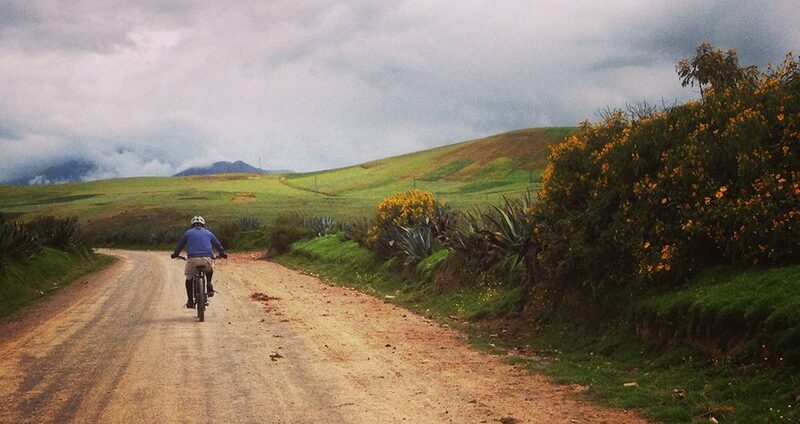 There are also gentler mountain biking routes in the Sacred Valley if you’re looking for an easier alternative. Our guides picked us up at our hotel in Yucay in the Sacred Valley at 9:00am with a van that had five bikes mounted on the roof, and we set out for the starting point of our mountain biking adventure. 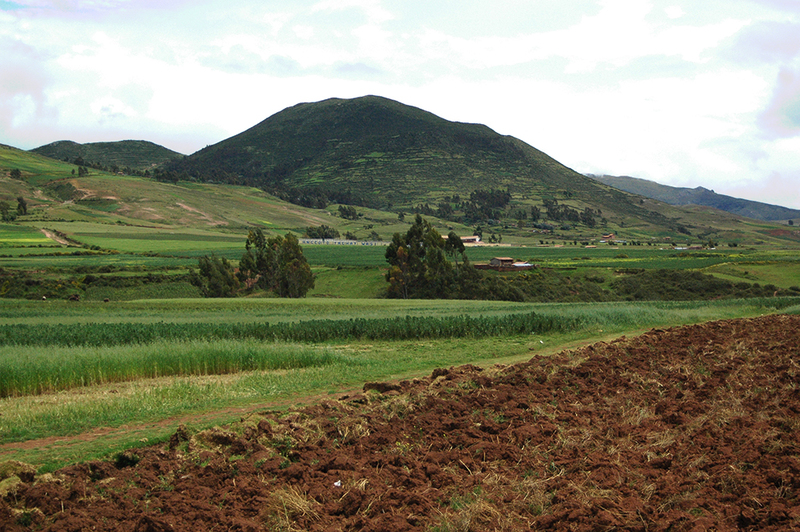 After a scenic 40-minute ride through the colorful farmland and meadows of the Sacred Valley, we pulled over near a trail head just outside of Chinchero. Our guides unloaded and adjusted the mountain bikes while we filled our water bottles before taking a quick practice ride. It was our first time mountain biking, so we were nervous about how we’d handle some of the more technical parts, though our guides assured us that any time we felt uncomfortable, we could always walk the bike. I’m used to urban riding and grew up riding my bike on winding gravel trails near my hometown, but these were real mountains so the top-of-the-range biking equipment was perfectly prepared to handle far more challenging trails than we were going to be on today. We began on a wide, flat path, riding by farm fields and small houses and occasionally locals passing with their donkeys and small children in tote. When we came to the first steep drop that was rockier than the opening section, we had our first taste of the adrenaline rush that I imagine more hard-core mountain bikers savor: coming upon a rough, downhill pass and searching for a clear path as you gain speed and avoid hitting the large stones and ruts that could throw your wheels careening off course. 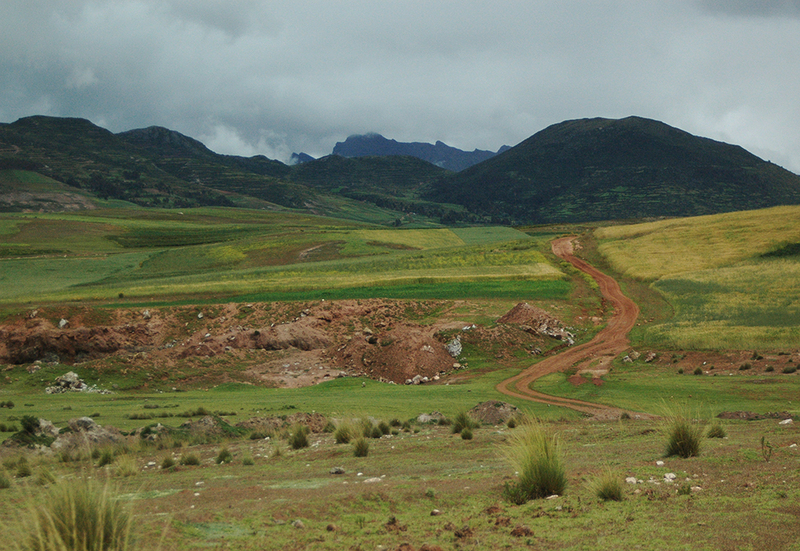 Flanked in the front and back by our guides, my parents and I made it down successfully and continued our ride as mountains from the Vilcabamba range came into view beyond the rolling, green hills. Soon we came upon an uphill pass, which tested our lungs and hearts, still adjusting to the high altitude of the region. My heart sputtered wildly until we came to the peak and rested. Once recovered, we continued in a single line with ample space between us for when we’d pick up speed. The van rode behind us with a first aid kit (just in case) and our luggage and jackets that we had quickly abandoned. 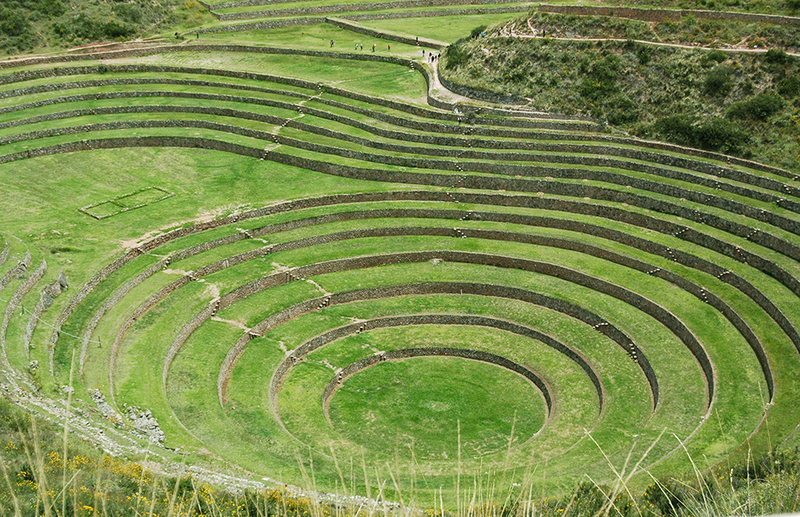 After a few more hills and a muddy patch from the recent rains, we arrived at the impressive archaeological site of Moray, one of the highlights of the Sacred Valley. Helmets still on and taking advantage of the break (and nearby bathrooms) to drink our water in greedy gulps, our guide explained the history of Moray, rings of stone terraces built into a natural depression in the earth. The symmetry of the rings was stunning, as well as the fact that after hundreds of years they remained in such impeccable condition. We took our pictures and headed down to the van nearby to have a picnic lunch under an awning. We made sandwiches with the fresh bread and ingredients set up for us buffet-style to help ourselves—and we certainly helped ourselves—while we talked with our guides, who told us about their various beloved mountain bikes, their own travel plans and other activities like rafting and trekking that they do in the valley. After Moray, the trail was mostly downhill, though downhill is not to say easy; there were some passes, where I had to set my pride aside and walk my bike because it was too technical, meaning too steep and stony for me to find a path without falling on my face! Walking and pride apart, the ride overall was certainly enough to induce a little adrenaline rush as I crashed down the rocky paths with feigned precision and took in the incredible views that the trail offered at each turn. When we got to Maras, I was reluctant to dismount the bike, already craving more practice on the mountain paths. 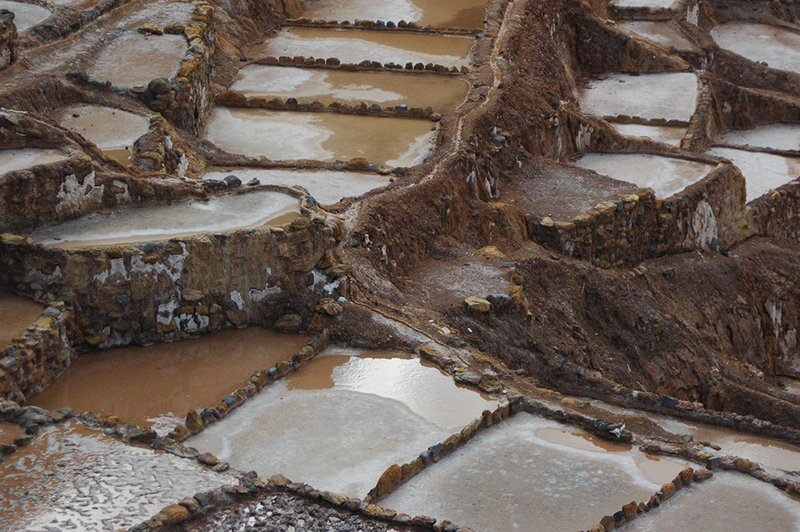 However, my sadness was overshadowed by our visit to the Maras salt pans. In Lima I had seen the famous salt from Maras at the organic market and in specialty shops, but this time I had the chance to see the source. The Incas adopted the concept of salt pans—stepped pools carved into the rock that collect natural salt from the water—from the one of the ethnic groups that the they incorporated into their sprawling empire. Now, each salt pan belongs to a family in Maras that gets the profits from the salt they produce, making it a sustainable site with minimal environmental impact. We bought salt from one of the shops at the entrance to the site, and I sampled the various chifles (plantain chips) and canchita (unpopped, salted corn kernels) that the vendors offered to visitors. From Maras, my parents and I climbed into the van and rode down the mountain from Maras to the main highway until we reached our hotel in Ollantaytambo. There, our guides, who, I have to add, were fantastic–friendly, patient and caring–helped us with our luggage and check-in and said goodbye. By then we were all tired but pleased with our biking venture—nothing feels as invigorating as trying something new, especially in a place as beautiful as the Sacred Valley. Who is the biking route suited to? You don’t need to be very experienced, but should comfortable in a saddle beyond city cycling to enjoy this biking adventure. 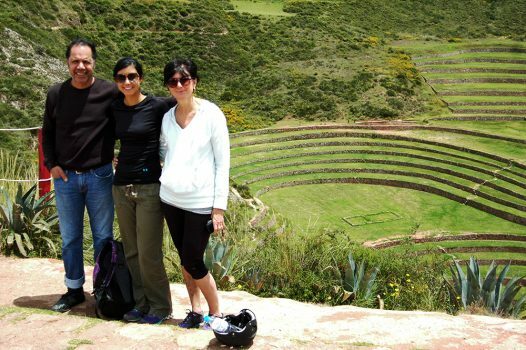 It offers an alternative and exciting way to get out into nature, get some exercise and take in some spectacular views of the countryside in Cusco. 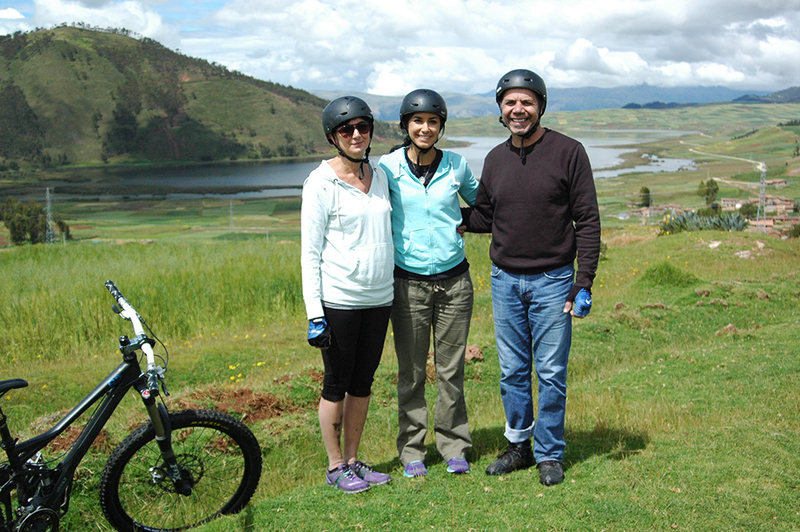 If you’re looking for a smoother, gentler ride, then Aracari also offers alternative mountain biking routes through the Sacred Valley, including trails that are suitable for families with kids of younger ages. Contact us for more information on adventure travel Peru and expert travel advice.